Corey Square is a dense neighborhood adjacent to Downtown. This neighborhood is bordered by Pearl Street to the north, Ashland Street to the east, Manchester Street to the south, and Union Street to the west. Corey Square was known historically as Janesville, named for Mrs. Jane Southwick, who inherited the land and developed the area in recognition of its growth potential. Corey Square is unique in that its angular streets deviate from the City’s planned “grid” at that time. 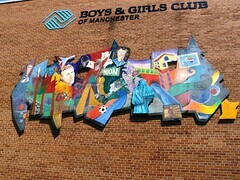 Established on March 30, 1846, Manchester Central High School is a comprehensive and accredited four-year school serving approximately 2,000 greater Manchester area students.